rec. Danmarks Radio, Radio House, Concert Hall, 9-10 Oct 1999 (op. 15); 23-25 Mar 2003 (op. 22). 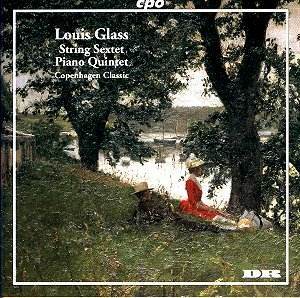 The music of Louis Glass has had quite a renaissance over the last two decades. The Fifth Symphony is a glorious late-romantic work that should be in everybody�s collection. I owe it to a good Danish friend of many years ago who sent me a much-prized tape of Glass�s masterwork, the Fifth Symphony Sinfonia Svastica - a reference to the Indian symbol of eternal renewal not the Nazi logo - for putting Glass on the map for me. There are now three versions of that Symphony (Jensen; Todorov, Marchbank) though none excels that radio tape (Danish Radio Symphony Orchestra/Michael Schønwandt). Since then all the symphonies have been recorded, much of the chamber music and a selection of the piano music. Here to join that selection is a disc of two earlyish larger-scale chamber works. The String Sextet blends the world of Grieg's Lyric Suite and Holberg Suite with that of Smetana's String Quartet No. 1 From My Life. This is especially true of the molto allegro and the scherzo in the latter of which Mendelssohn's Octet might be playing a part. There's that same feeling of immersion in life but with the artists always keeping a backward cast eye on inimical fate. There's an andante that is influenced by the Siegfried Idyll. The finale is an allegro giocoso which, despite its mood marking, is not uncomplicatedly joyous. This is another fine romantic octet in the later classical vein although the finale is over-extended. The Piano Quintet is of symphonic proportions at not all that short of forty minutes. It is dedicated to the Swedish composer Tor Aulin. It has a shimmer and shuddering triumph which sounds ceremonial - almost imperial at 3:02 in I. There are moments where it is like the more regal parts of Tchaikovsky Piano Concerto No. 2. In the second movement molto adagio there are some monumental lumber and cumber effects as at 4.30 of the piece. The final Allegretto Scherzando has some of the ballroom bustle of the String Sextet - a touch academic perhaps. In the sentimental Allegro Risoluto it is as if a ballad is sung articulated in amber and sepia by the cello solo at 1.10. Bruckner�s rush and halt, rush and halt can also be heard (8.19). Neither work touches the heights of the Fifth Symphony but this is honest music which retains the capacity to charm and move.